The Rotman School of Management at the University of Toronto (U of T) has grown substantially over the last 12 years. Consequently, this innovative business school has outgrown its downtown space, resulting in a $91.8-million expansion project that includes construction of a new 15,004-m2 (161,500-sf) building clad with a curtain wall system incorporating ultra-high-performance concrete (UHPC). (See “Innovative Bridge Decks Field-cast UHPC joints for precast bridges,” by Vic Perry, FCSCE, M.A.Sc., P.Eng., Primo A. Scalzo, M.Sc., P.Eng., PE, and Gary Weiss, P.Eng., MBA, in the September 2007 issue of Construction Canada. Visit www.constructioncanada.net and select “Archives.”) Scheduled for completion in 2012, the building will be more than double the size of the original school. 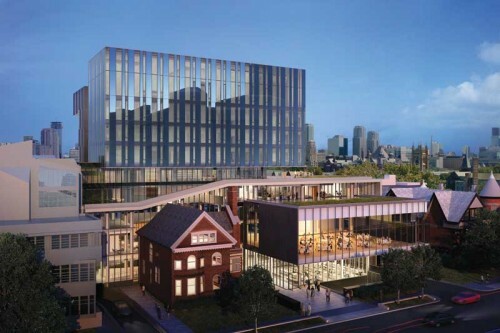 According to the project architects, Kuwabara Payne McKenna Blumberg (KPMB), the new building design is a direct expression of Rotman’s core mission to promote creativity, innovation, and integrative thinking in 21st century business education. It responds to different scales and conditions presented by the surrounding context––in this case, it mitigates between a historic 19th century residence and the massive scale of the Robarts Library. It carefully maintains views and minimizes shadow impact on one of the city’s architectural treasures––Massey College—to the east. The overall concept advances the school’s long-term sustainability and business strategy, and will meet Leadership in Energy and Environmental Design (LEED) Silver requirements. (See the project description and full credits on KPMB’s website. Visit www.kpmb.com). 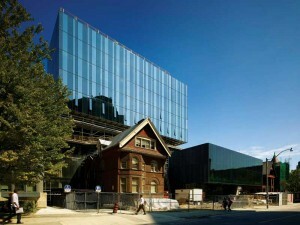 A blend of old and new architecture at the University of Toronto’s Rotman School of Management. The building’s exterior curtain wall includes more than 350 dark grey precast UHPC panels, just 30 mm (1.2 in.) thick. Produced by a local precaster in Brampton, Ont., these unique, ultra-thin panels vary from 0.5 to 1 m (1.6 to 3.3 ft) wide x 3.5 to 5.3 m (11.5 to 17.4 ft) high. 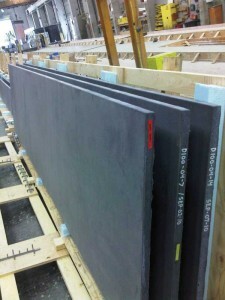 In addition to the cladding, over 100 UPHC panels (19 mm [0.75 in.] thick) will be used to create an interior wall––an attractive and functional design feature that complements the building’s exterior. You May Also Like Concrete Cracking Problems: A modern-day phenomenon? Early in the conceptual stage, the architects conceived of panels with a specific colour and textural quality desired for the opaque sections of the curtain wall. KPMB explained the panel colour was derived from the context of the site, specifically from the black slate rooftops of the numerous heritage houses that line St. George Street––the main artery of the university. The panels were to be an evocative element of the building’s design. The west side of the building showing matte, dark grey ultra-high-performance concrete (UHPC) panels with tinted glazing. The UHPC choice was derived from its ability to achieve these features and meet structural requirements. The east façade was made to facilitate the integration of an opaque panel into a high-performance curtain wall. The esthetics of the precast UHPC was paramount in the decision as it provided the subtle matte finish within the colour range desired. The alternate material choice of a stone panel has severe size limitations, and aluminum panels are limited in finish, therefore unable to provide the same heterogeneous qualities evident on precast and stone materials. The subtle variations––part of the cast nature of the material––add a natural quality to the panels, and their soft matte finish contrasts with the darker reflective qualities of the adjacent glass. The play of light off the façade changes throughout the day and offers a nice backdrop to Ron Thom’s Massey College. A façade solution was developed during the early stages to meet design requirements and achieve the architects’ goals. The design criteria was ambitious because the university preferred a long-span façade panel (up to 5.5 m [18 ft]) that was thin and lightweight with a hard, durable exterior wall surface that would endure for a long time––with little to no visible signs of wear from elemental impacts. UHPC provided a very thin, monolithic-plate, slab-type design with a custom coloured and moulded surface aspect that would essentially ‘plug-and-play’ with current curtain wall framing systems, without intermediate jointing. Through a series of sample runs and panel mockups, the final design took shape. Due to the custom-fabricated panel material, there were several iterations developed to achieve the desired result. It was a new material, so the team needed to understand the limitations and potentials before homing in on the final panel process and appearance. The material’s finish and colour were a challenge due to the extreme detail capable with UHPC, but through a careful approval process with the fabricator, even down to the grit of the sandpaper used on the formwork, the challenges were surmountable. UHPC panels being crated for shipping. UHPC offers almost limitless possibilities in terms of colour and texture. It was crucial the panels’ appearance corresponded to the architects’ vision and, once the official sample was approved, the next challenge was to replicate it in a full-sized panel to verify fabrication techniques before production could begin. a way to weave together the façade to break down its overall scale and create a restrained, quiet, yet whimsical backdrop to the university campus to the west and Massey College across from it. 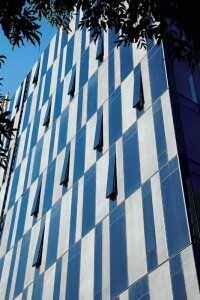 The elevations where UHPC cladding is used mostly consists of offices and study rooms. Each office is typically 3 m (9.8 ft) wide and the panel grid is on the metre and half-metre module. Each office has a 1-m (3.2-ft) solid UHPC panel, a 1-m vision glass floor to ceiling panel, a 0.5-m (1.6-ft) panel of solid UHPC, and a 0.5-m glass panel with a full height vent. Reversing the layout of the façade between floors creates a woven, syncopated pattern that unifies the elevation and promotes the natural qualities and capabilities of the UHPC panel. The panels run floor to floor in height, with some locations exceeding 4.5 m (14.8 ft).